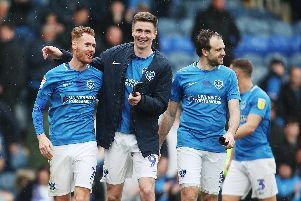 Ronan Curtis feels Pompey’s 4-0 FA Cup win at Maidenhead has provided another shot in the arm for the team as they go for success this season. The attacker was named man of the match on Saturday after setting up the opening goal and playing a key role in the attacking play throughout. Kenny Jackett’s men are going for promotion this season and are sitting at the top of League One. Now the emphatic victory in the FA Cup away to the non-league side has added to the momentum. They didn’t suffer the same problems many sides have when facing underdogs in the competition. The feeling continues to grow the team can achieve their targets this season. Curtis is pleased with how things are playing out after being clear with his own goals when he arrived at Fratton Park in the summer. He told BT Sport: ‘I know what I wanted to do when I first came here in the summer. ‘I want to better myself and hopefully get into the Championship in my first year here. ‘There’s a great morale around the team and around the training ground. Curtis had to produce a good run up the slope on the difficult pitch to set up the first goal for Ben Thompson. It wasn’t the nice playing surface the Blues are more used to at Fratton Park. But the Irish winger’s attacking play certainly didn’t suffer on his bow in the competition. He added: ‘That’s my FA Cup debut and first of many hopefully. I enjoyed it.